FLOWER MOUND, TX (9/4/13) – Group 1200 Media, in conjunction with Giant Ape Media, announced today a partnership with TUGG to release live-action Korean zombie coming of age melodrama, LET ME OUT theatrically in three U.S. cities simultaneously for one night only on Wednesday, September 25th at 7:30pm. The film will be released theatrically in San Francisco, CA, San Diego, CA and Dallas, TX in select theaters. Advance ticket sales available through TUGG, a grassroots movie distribution business model. Directed by Chang Lae Kim and Jae Soh, the film stars popular K-drama actors, Hyun-Sang Kwon (THE KING 2 HEARTS and QUEEN OF AMBITION) and K-pop star, Hee-von Park from SM Entertainment’s girl band, MILK and star of (GRAND PRIX, READ MY LIPS, FAMILY and GOD’S QUIZ SEASON 3). LET ME OUT is Kwon’s first lead role in a motion picture and he is the son of acclaimed Korean director, KWON-TAEK IM (Director of CHIHWASEON and Winner of Best Director at the 2002 Cannes Film Festival). “Coming off the success of a sold out screening and celebrity red carpet U.S. premiere in Los Angeles, we learned FUNimation fans want to be involved in helping us plan our events. They demanded we bring LET ME OUT to additional markets across the country,” says Adam Zehner, VP of Distribution, FUNimation Entertainment. “Through TUGG, a wide variety of films can be shared within local communities and promoted online. We’ve been waiting for the right film to partner with them on and feel this is the perfect vehicle to help launch LET ME OUT here in the U.S.,” adds Zehner. “The demand for LET ME OUT in other markets across the country has been heard, Group 1200 Media listens to fans of FUNimation and Giant Ape Media. We believe we need to bring LET ME OUT to fans of independent film, everywhere. By using TUGG, we are giving filmgoers the opportunity to demand the film for their own town. They become the brand champion for the film to help spread the word online, ” says Scott Lonski, Director of Marketing Services, Group 1200. “Word of mouth about K-drama star, Kwon Hyun-Sang’s feature film debut and breakout performance in this film is building online. TUGG gives audiences everywhere the opportunity to use social media to organize screenings in their hometowns and spread the word to friends and online communities using Facebook and Twitter. If you like Asian cinema and Korean dramas or if you’re a fan of indie and arthouse films, this film is for you,” says Irene Cho, Producer, LET ME OUT. FUNimation & Giant Ape Media are partnering with Drama Fever again on these four LET ME OUT screenings to help spread the word and are planning contests for free screening tickets and unique film experiences similar to the one in LA where Giant Ape hosted a contest with an opportunity to attend a dinner with the film’s director, lead actor and VIP tickets to the premiere. Written, directed and produced by Korean Americans, LET ME OUT is written and directed by Jae Soh and Chang Rae Kim. Produced by Min Soh and Irene Cho. Executive Produced by Jae Soh. LET ME OUT is the first Korean independent film released back to back in both Korea and the U.S.
LET ME OUT is a Korean language coming of age melodrama and pays homage to Day For Night (France), Living In Oblivion (USA) and Korean cinema. LET ME OUT pokes fun at director Yang Ik-June who won the 2009 Rotterdam Film Festival’s Tiger Award for his film, Breathless. Director of M, Duelist, Nowhere To Hide and Korean film icon, Lee Myungse is cast as himself. This zombie melodrama is Mu-Young film school opus. An eternal senior, he knows everything about cinema but nothing about actual filmmaking. Critical of everyone else, he heckles the famous indie director Ik-June Yang at a campus screening and somehow receives film funding. His dream of working with his love-interest Ah-Young becomes a nightmare. Everything that can go wrong does. Barely surviving a disastrous shoot, Mu-Young learns making a movie is like love, you can’t do it alone. LET ME OUT is a tribute to guerrilla, indie, amateur, low-budget cineastes struggling to create. It is hope. LET ME OUT opened in Korea on August 15, 2013 and is being distributed through Baekdu Daegan Film Company in approximately 15 theaters including Art House Momo (Baekdu’s Art House theaters), CGV Movie Collage (the Art House division of CJ Entertainment), and Artplus Cinema Network in various cities throughout Korea, including Seoul. The film had its red carpet US Premiere at the Downtown Independent Theater in LA on August 16, 2013 to a sold out audience with director, Jae Soh and Kwon Hyun-Sang, the film’s lead actor attending from Korea. LET ME OUT is the first Korean independent film released back to back in both Korea and the U.S. and is distributed in the U.S. by Funimation Entertainment, a Group 1200 Media company, based in Flower Mound, TX. 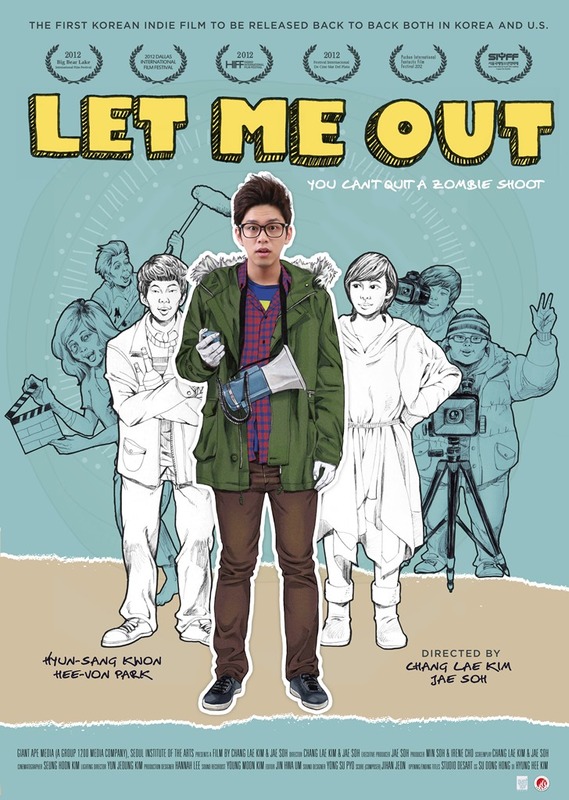 Next Korean Film “Let Me Out” – We Need to Secure 67 Tickets To Secure Screening!